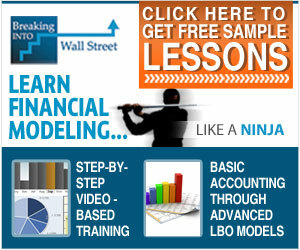 Advanced Financial Modeling teaches you how investment bankers model companies in real life. Everything is based on a case study of Microsoft’s offer to acquire Yahoo, and real SEC filings and equity research from banks such as Credit Suisse and Morgan Stanley are used throughout the course. You’ll learn advanced modeling skills by completing a detailed operating model, a full valuation using 9 methodologies, an advanced merger model that combines all 3 statements and an advanced LBO model with support for 7 tranches of debt. Lessons cover advanced operating models, valuation based on SEC filings and equity research, complex merger model, advanced LBO model, and pitch book / deal commentary. 100 videos total (36 hours of footage). Operating Model lessons teach you how to create a detailed 3-statement model, including revenue and expense builds, noncontrolling and equity interests, PP&E schedules, deferred taxes, and quarterly projections. Valuation lessons cover how to spread comps, adjust for non-recurring charges, calendarize financials, how to value NOLs and equity investments, and how to complete advanced DCF analysis including mid-year discounts and stub periods; you’ll also learn future share price analysis, sum-of-the-parts valuation, and liquidation valuation. Advanced Merger Model covers how to combine all 3 statements, multiple scenarios, advanced purchase price allocation, how to calculate revenue and expense synergies by segment, and book taxes, cash taxes, and Section 382 NOLs. Advanced LBO Model covers how to modify an operating model to make it into an LBO model, 7 debt tranches, multiple capital structure scenarios, and an advanced debt schedule with mandatory and optional repayments. Includes sample pitch book and PowerPoint crash course as well as commentary on the deal. You receive instant access when you sign up because everything is delivered online – no shipping charges or physical products to worry about. Sample Yahoo! Video – Debt Schedules: Mandatory Repayments. Sample Yahoo! Video – Book vs. Cash Taxes & Section 382 NOLs. Sample Yahoo! Video – Advanced Purchase Price Allocation. Sample Yahoo! Video – Microsoft / aQuantive Precedent Transaction. Sample Yahoo! Video – Valuing Yahoo’s Net Operating Losses (NOLs). Sample Yahoo! Video – Search Advertising Revenue Model. Sample Financial Modeling Video – Sensitivity Tables. Sample Excel Video – Cleaning Up Data.